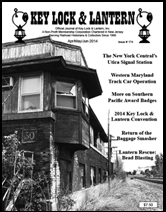 Gaithersburg Railroadiana Show, Brookline Auction Report, KL&L Convention Announcement, CP Rail Holiday Train Contest, Santa Fe Convention Announcement, Catskill Mountain & Berkshire Scenic News, Want Ads & Railroad Event Calendar. 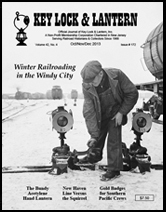 Railroad Memories Auction, Union Pacific Steam, Fall Foliage Excursions on Amtrak & Steamtown, KL&L Founder Paul Pietrak, D&H South End Sold, Alaska Railroad Artwork, Erie Lackawanna SD-45-2, Frisco Texas Museum, JW Auctions Are Back, Want Ads & Railroad Event Calendar. 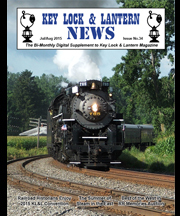 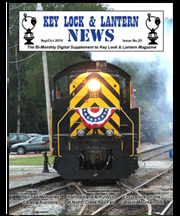 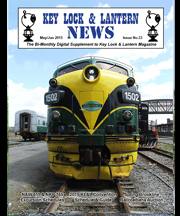 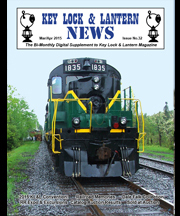 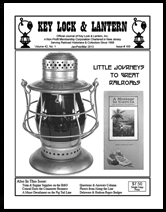 KL&L Convention Report, Nickel Plate 765 & N&W 611 Excursions, Railroad Memories Auction, Steam in the Catskill Mountains, Upcoming Buffalo Central Terminal & Timetable Collectors Shows, Want Ads & Railroad Event Calendar. 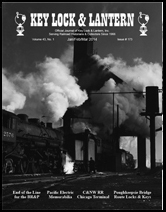 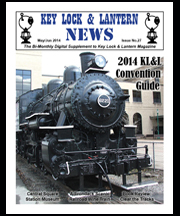 KL&L Convention Information, Brookline Auction, N&W 611 & Nickel Plate 756 schedules, Gulf Curve Wreck exhibit & more Railroad Preservation News, Want Ads & Railroad Event Calendar. 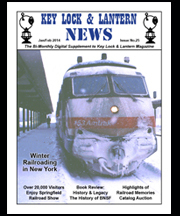 KL&L Convention Information, Railroad Memories Auction, Dale Falk Collection Sold by Dirk Soulis, Lincoln Funeral Train, Pullman Historic Site, Buffalo Heritage Discovery Center & more Railroad Preservation News, Want Ads & Railroad Event Calendar. 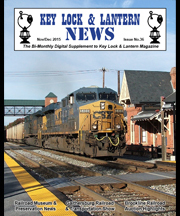 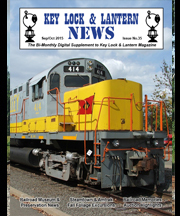 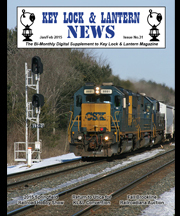 KL&L Convention Announcement, Springfield Railroad Hobby Show, Brookline Railroadiana Auction, CSX Supports Railroad Preservation, Alco Historical Show, Amtrak Train Days & more Railroad Preservation News, Want Ads & Railroad Event Calendar.